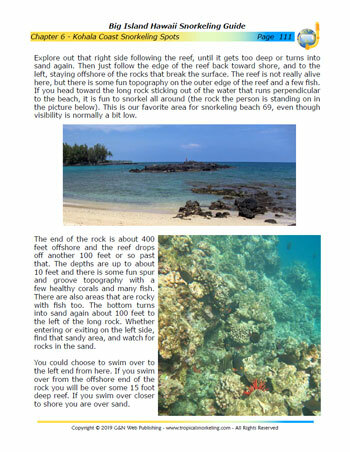 The Big Island Hawaii Snorkeling Guide eBook comes from an extensive amount of in the water research, snorkeling our favorite of the Hawaiian Islands. Just had the most amazing trip...the snorkeling was the best we have ever encountered! We never would have found some of the gems without your book! ...It's full of all the amazing advice we wished we had on our Maui trip. Thanks for all the effort you put into it...it shows!! I highly encourage snorkelers to purchase this book! 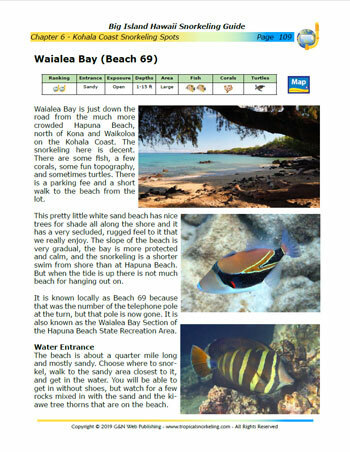 It provided a wealth of information about where to snorkel, each location's unique conditions and many other tips. I found the information to be accurate and up to date. Next to my mask and snorkel, this was a key purchase! Wouldn't you love to see all the fish at this rarely snorkeled spot? 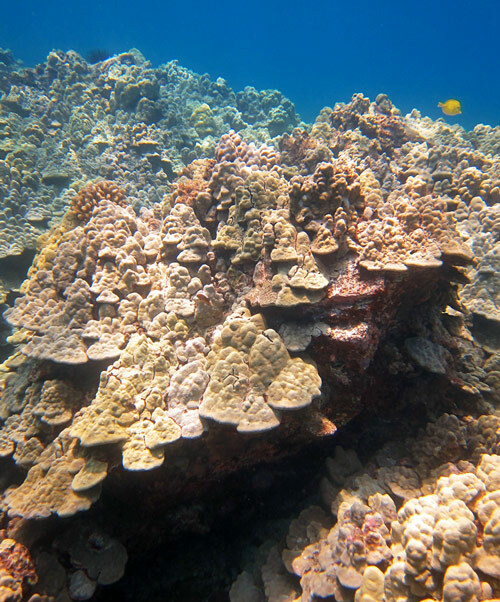 And see the amazing corals at this almost unknown location? 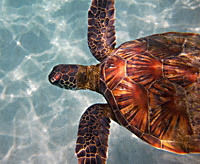 What's In The Big Island Snorkeling Book? 34 Of The Best Snorkeling Sites - Why Not 60? We have snorkeled the island's 60 or more beaches extensively. But we don't make you read about beaches with poor snorkeling. Instead we focus 100% on getting you to the best snorkel sites and go overboard with useful descriptions and pictures of what it is like and how to get there. Compare this to general travel guides that are not written by snorkelers and only give a few sentences about each location. Sites At A Glance - A reference and ranking of all the spots. 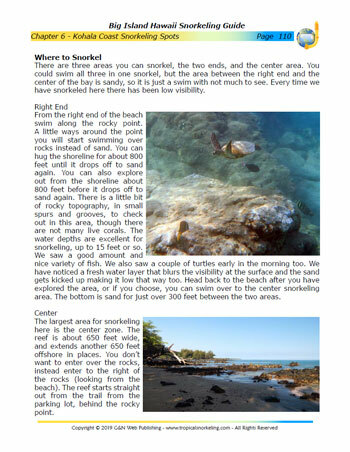 When things change we update the Big Island Snorkeling Guide eBook, like when storms closed Kapoho in 2015, or when we find errors or bad links. Printed guides are not updated until they sell all the printed copies. 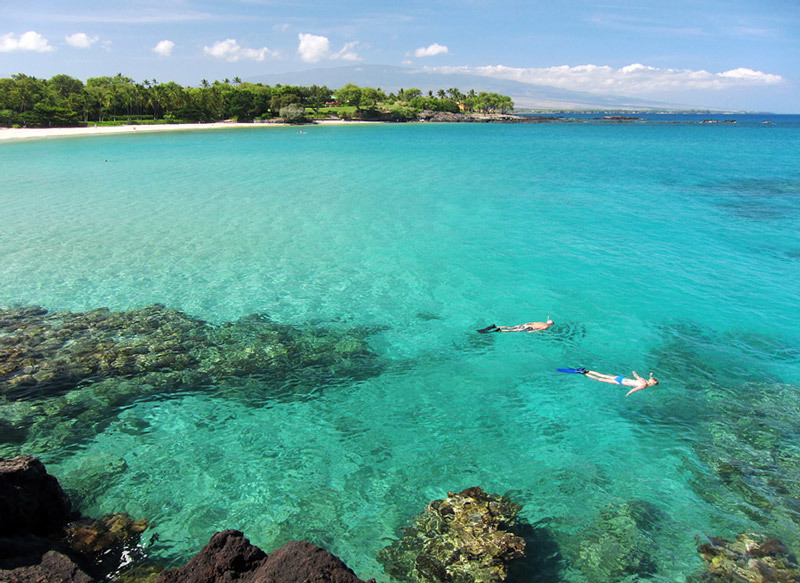 The vast majority of the best snorkeling spots on the Big Island are accessible from shore. That means you don't have to go on crowded boat tours on their schedule, to spots you can't control, no matter the weather. Your snorkeling will be better and you will save money in the process. Where boat tours are a good idea, we recommend them. 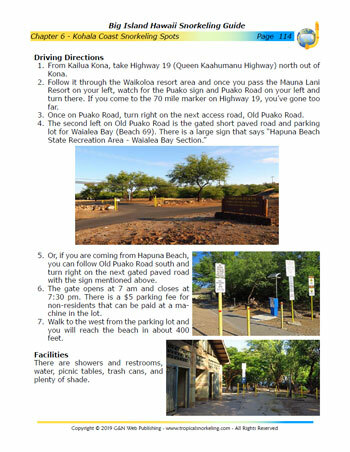 This is an extremely well-written, accurate and complete guide to snorkeling on the Big Island. We are both marine biologists who do research at several of the snorkeling spots in the book and we think this book is great. It provides excellent maps and pictures of the sites, making it easy to find them for the first time. 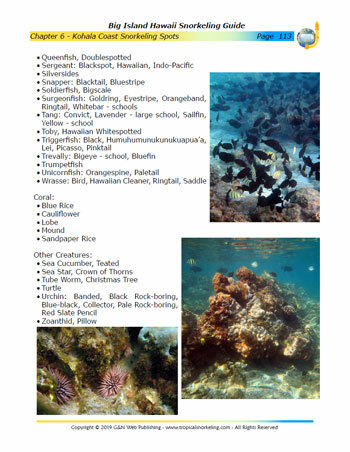 Each site is described in such detail that you know the best and safest places to enter, where to snorkel for the best coral and fish, where to park, and all other necessary information. 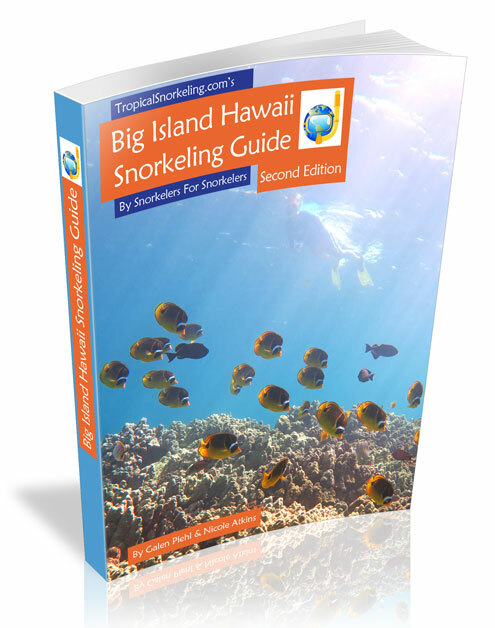 The chapters on safety and etiquette, snorkeling equipment tips, Big Island travel tips, and the fish identification guide are also extremely useful. Anyone who wants to snorkel on the Big Island should definitely buy this book. 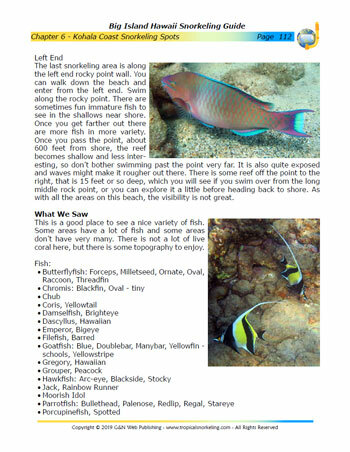 And even for people very familiar with Big Island snorkeling, the book offered great information on many new sites for us to try. Especially in Hawaii, where snorkeling can sometimes be challenging, this book is absolutely essential. 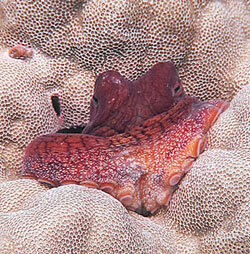 It is the only book we've ever seen that is truly written for snorkelers (not divers). And because of that, your snorkeling experience is fantastic. I just wish that Galen and Nicole had snorkeling books for more places!